Beebbeeb app allows you to discover and place orders at restaurants that deliver food to your home. Technoduce has been bestowed with a readymade online food ordering system, helps in providing a solution for a wide range of food industry. 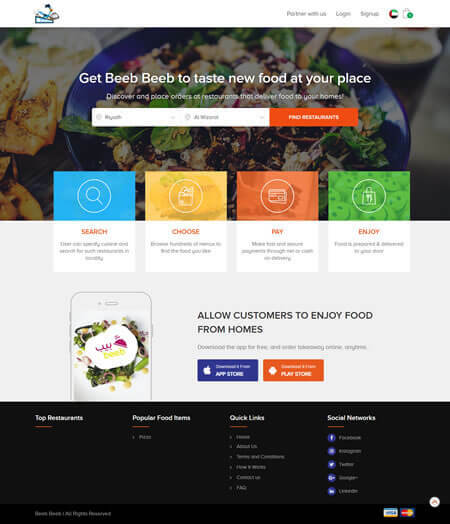 Beebbeeb, the online ordering software is packed with backend control through which Admin owner can list the food items and appropriate front end options for users to order food based on the location. The application is provided on both the web and mobile platform. An Android app for delivery staff too. Our clients are extremely happy and satisfied with the work delivered by us. Check out some of our client reviews for the same ordering and delivery application. JLL, Kotak Mahindra are some of our trustworthy clients. &COPY; Technoduce Info Solutions Pvt. Ltd. All rights reserved.